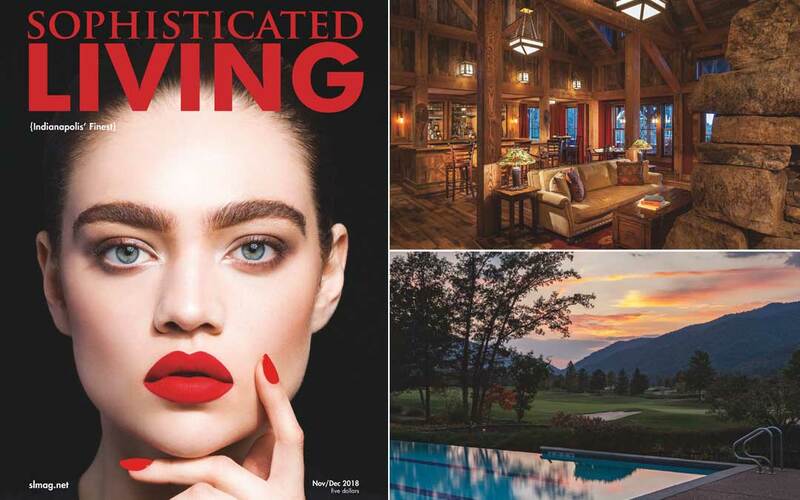 Jeffrey Cohen, the Editor-in-Chief of Sophisticated Living Indianapolis, recently visited The Greenbrier and Sporting Club. Below is his (along with his family’s) personal recount of the many amenities and activities he enjoyed during his stay. 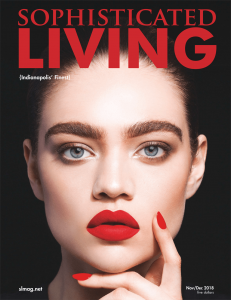 To view the digital magazine in its entirety, please click on the thumbnail below. As regular readers of this page know by now, my wife, Jen, and I enjoy availing ourselves of new experiences, whether they be culinary, travel-related or, in the case of a recent endeavor, doing things outside our comfort zone. I have long harbored a sometimes irrational fear of heights, especially when I’m close to the edge of a high place with no windows or rails to protect me. It’s as if the edge is a magnet, both repelling me and drawing me at the same time to an ignominious doom below. Towards the end of this past summer, Jen and I were fortunate to find ourselves with our kids at The Greenbrier, the jewel of the Alleghenies, in search of rest, relaxation and, yes, new experiences. We had decided that Jen would be in charge of scheduling activities, something that had to be taken care of well in advance because, as we found out to our disappointment, falconry sells out pretty fast down there. On the first full day, after hacking our way ‘round The Snead and a spot of light lunch at the nineteenth hole, I was informed that our activity for the afternoon would involve off-road driving on the mountain directly behind the resort, a tree-shrouded peak of some 3,000 feet that soared into the wispy clouds of the Appalachian summer. I had visions of churning along muddy paths around the hill’s perimeter in some sort of ATV, merrily bouncing over logs and dodging squirrels. 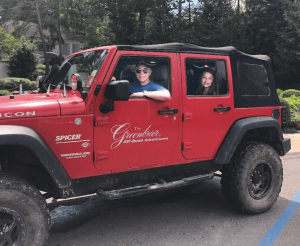 When I laid eyes on our vehicle—a fully tricked-out red Jeep Rubicon with tires as tall as my son—I knew this was going to be outside my normal comfort zone. Before we set out, our guide, a relaxed dude by the name of Pepper, showed me the controls of the aptly named monster and explained a phenomenon known as “loss of horizon.” This occurs when you are going up a grade that’s so steep you cannot see the road in front of you. “All you have to do is keep your wheels straight and you’ll be just fine,” Pepper said in his deep, even tone. I took the wheel, with Pepper in the sidekick seat and Jen and the kids buckled in behind us. Once on the mountain, I realized we were ascending at a fair clip. And not just going up some bucolic palisade road through stands of ancient ash trees. No, we were climbing a narrow track carved into the very edge of the mountain, looping around the perimeter like a whirly bird. As the drop immediately to my left began to stretch out from dozens to hundreds of feet, I began to wonder if maybe we should have attempted the free rock-climbing experience instead. At least I would have had something more substantial to cling onto than the steering wheel of a four-ton Jeep that, in spite of my best efforts to control it, seemed hell-bent on hurling itself off the edge at any given moment. Or so I believed, as my fear of heights began to manifest itself. After a few hundred yards, the road began to steepen at an impossible angle, and our pace slowed. Rounding a curve and ascending a sharp rise, I realized that I couldn’t see the path ahead. I didn’t panic, but I began to feel a familiar clenching in my spine and sweat on my brow. This was the loss of horizon that Pepper had mentioned. “Just straighten your wheels,” he said, in a matter-of-fact tone. I realized the only way to see the wheels would be to lean out the window and take a look. If you recall the bit in “Vertigo” where James Stewart is on the ladder and the camera does that reverse zoom thing, that’s exactly what I experienced when I saw the almost vertical drop of 600 feet just inches from my left front wheel. I gulped and straightened the wheels. The following day, Jen, the kids and I made a similar ascent of the mountain, this time on horseback. It was only marginally less terrifying, but at least my horse didn’t have suicidal tendencies. I’d say I’m relieved all of it is behind me, but in a few weeks, Jen and I are visiting Paris for our 15th anniversary. And guess what’s there? A huge, rusting iron tower with a restaurant on top. The prospect of ascending the Eiffel Tower frankly terrifies me. I know I faced some of my deepest fears at The Greenbrier, but have I overcome them? I think I’m going to find out the hard way. There is home-away-from-home, and then there is The Greenbrier. Located amid the breathtaking mountains of West Virginia in White Sulphur Springs, this unique institution is a National Historic Landmark and world-class resort that has been welcoming patrons from around the world since 1778. The natural mineral springs that attracted the first guests over 240 years ago continue to draw visitors to the luxury resort today. With a registry that has included 27 of our country’s 45 presidents, America’s Resort™ has long been a favorite destination of royalty, celebrities and business leaders. Famous for its restoration and remodeling by Dorothy Draper in 1948, as well as its world-class golf courses designed by Jack Nicklaus and Charles Blair Macdonald, The Greenbrier is unique among holiday destinations. Considered a luxury retreat from its inception, this grandest of grand hotels began to further bolster its already sterling reputation as a sporting haven when it was purchased from the CSX Corporation by entrepreneur (and future Governor of West Virginia) Jim Justice in 2009. Wandering through the hotel’s lobby one afternoon, I was impressed by a scale model of the resort and its environs, including the 14 residential neighborhoods currently under development in what must be the most luxurious home-away-from-home community imaginable. Intrigued, I arranged to meet for tea with John Klemish, broker-in-charge at The Greenbrier since 2000, the year plans were drawn up by CSX to parlay a small part of the estate’s massive 11,000 acres into luxury residences for a highly discerning clientele. 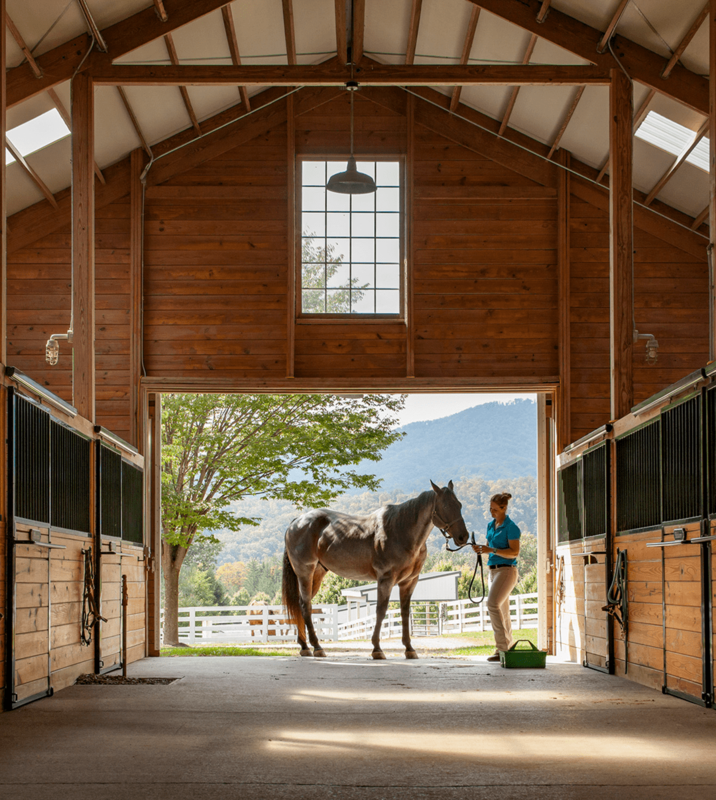 Those who purchase property at The Greenbrier are not required to build on their homesites, but upon going under contract they are obliged to join The Sporting Club, whose services are available to members only, as distinct from the main resort, which is open to the public. Drawn by the property’s history and sheer exclusivity, many individuals have purchased lots purely to become members of The Sporting Club. 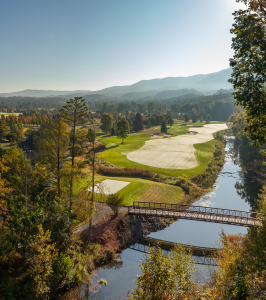 Offering an exceptionally high standard of facilities, The Greenbrier is without rival in the United States: very few, if any, second-home communities can boast the PGA, the NFL and the USTA on campus. Recently, Justice built a 2,400-seat tennis amphitheater, where Serena and Venus Williams played this year in mid-September at a sold-out exhibition tournament. During our all-too-brief sojourn at The Greenbrier, we did our very best to try our hand at as many activities as we could squeeze in, and being a family-friendly place, there was plenty for the kids to do, too. While Jen and I took shots at clay pigeons and fired bows and arrows, Izzy took personal fishing lessons from the resident pro, and Gracie worked on her backhand. All told, guests of The Greenbrier can avail themselves of 22 restaurants, the only private casino in the United States, and more than 55 distinct activities that include golf, four swimming pools, a bowling alley, a movie theater and much, much more. 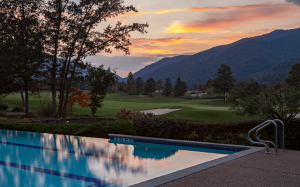 In addition to these activities, members of The Sporting Club enjoy exclusive facilities, including the private, award-winning course, The Snead. It was here that I happened to consume arguably the best PB&J—made with pistachio butter—I have ever encountered, as well as hack around probably the toughest golf course I have ever played. Later on, Jen, the kids and I decided to throw our fates to the wind with off-road motoring and horseback riding. Readers can learn more of these personal experiences in this issue’s letter from the editor. Dining at The Greenbrier offers a myriad of options, all of them delectable. 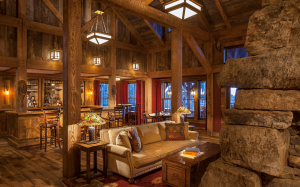 Exclusive to members, perched 3,300 feet above the valley floor, The Summit lodge offers a lofty retreat for those who value their privacy. With a world-class restaurant commanding spectacular views, the traditional décor brings to mind the plaids and burnished wood paneling found in Scottish hunting lodges; the highly accomplished cuisine reflects the sophisticated rustic setting. Another notable culinary highlight was dinner at Jerry West’s Prime 44 West, where we enjoyed 35-day aged prime rib and Dover sole, surrounded by NBA-themed décor that reflects the basketball legend’s storied career. 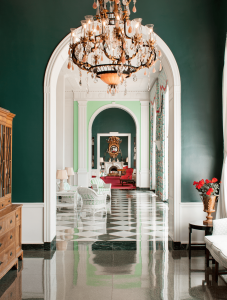 Although purchasing a home at The Greenbrier might fulfill a lifetime’s ambition, enjoying everything this fabled resort has to offer for a few days makes for a close second. As much as Jen, the kids and I crammed into our five-day visit, we left a host of activities undone. To judge from its history and longevity, however, I suspect The Greenbrier will still be there next time we wish to pay a visit.